1.Watch video tutorial before getting start, Make sure you know all the steps. 2.Check the LCD to make sure the flexible cable in good condition and no debris/visible dust on the connector. 3.Please keep your phone power off when assembling. permanent damage to your iPhone. 5.Please connect the flex cable on the dock one by one and make sure all the connector are well seated. cable can solve this problem. ★ Magnetic screwdriver removes screws more effectively,and prevents screws from losing. ▶ 【Quality Guaranteed】：Each iPhone 7 Screen Replacement LCD was double tested before shippig and working perfectly,more wearable. 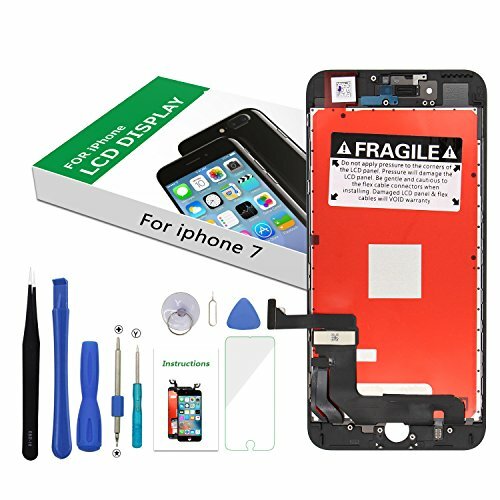 ▶ 【Great Replacement】：To replace faulty, defective, cracked, dead white iPhone 7 digitizer replacement assembly with great color pixels and resolution display LCD as original. ▶【Complete Tools Kit】：A set of tools for replacing the screen, including protective film,triangle skid sheets,LCD Screen Opening Pliers, PVC sucker,Two-head screwdriver etc. ▶ 【Easy to Install】：You just watch a YouTuBe video, according to the video operation,you can easily install a new screen. ▶【Perfect Package】：Screens and tools are packed in exquisite boxes and are not easily damaged or crushed. If you have any questions about this product by i DIY, contact us by completing and submitting the form below. If you are looking for a specif part number, please include it with your message.